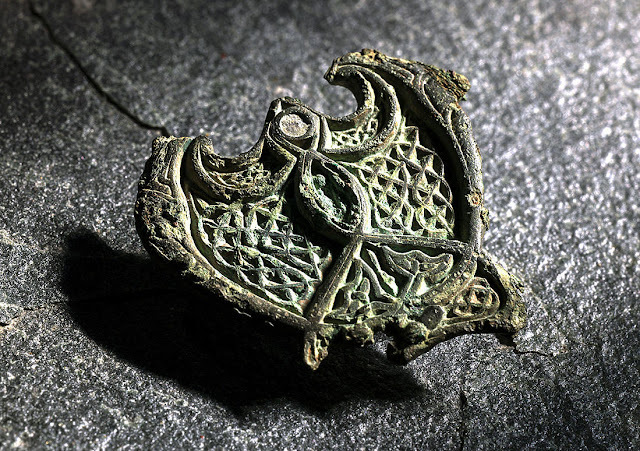 Celtic brooch dating back to the Viking age found in Norway. A bronze Celtic brooch, dating back to the 9th century was found by a man metal detecting on Agdenes farm at the south end of Trondheim Fjord, mid-Norway. Experts believe it was made in a Celtic workshop, but stolen during the Viking raids in Ireland. It is in pristine condition and features a bird figure that has two “wings” with patterns representing a dolphin or fish. These patterns reveal the date which the object was made. It was tradition for middle to lower class Viking women to be buried in a traditional dress and often jewelry which was stolen during raids. The location where the brooch was found has been mentioned a number of times in Norse sagas as a place where warriors gathered prior to sailing off to continue their journey towards the British Isles.